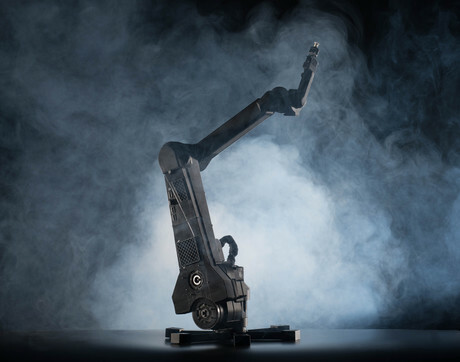 At RightHand Robotics, design iteration doesn’t end once a product is shipped. The ability to make changes to a product’s design during the production process—agile manufacturing—makes it possible for engineers and designers continuously improve final products. We sat down with Sarah Mendelowitz, lead of the RightHand Labs team at RightHand Robotics, and Kat Ely, designer at partner organization CLEAR design lab, to talk about their production process for the ReFlex Hand, and how both companies view 3D printing as an integral tool for successful, collaborative manufacturing. 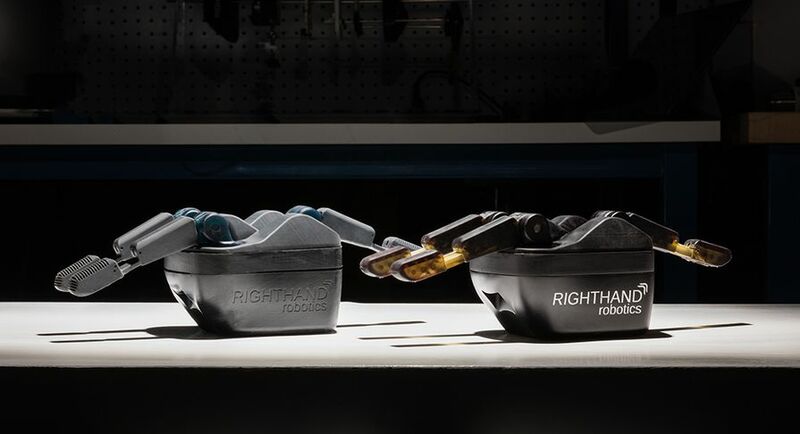 Watch this video to learn more about how RightHand Labs and CLEAR design lab collaborate to produce ReFlex Hands.How do Righthand Robotics and CLEAR design lab work together? Sarah: At RightHand Robotics, we make robotic systems for order fulfillment in warehouses. 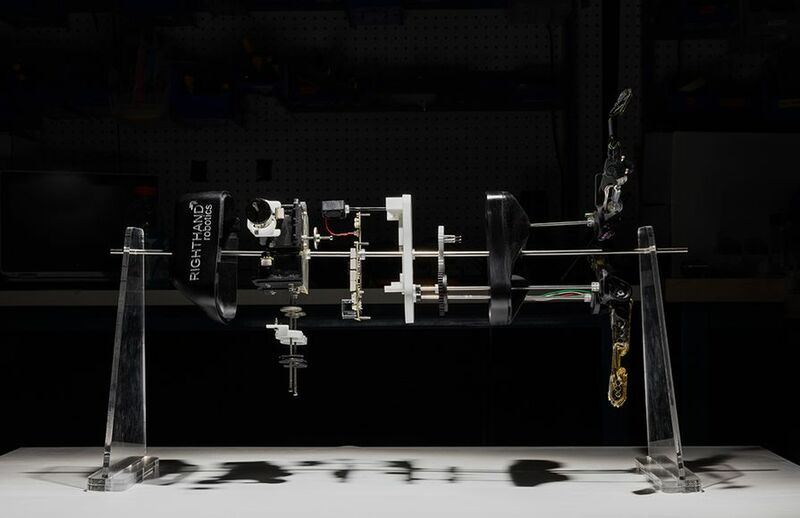 RightHand Labs is the part of RightHand Robotics that sells the hardware that we’re designing to people doing robotics research in universities. RightHand Labs is like a small manufacturing facility for our hardware products. So we do everything from designing hardware, to manufacturing it, to support and sales. Kat: CLEAR design lab fabricates all of the parts [for the ReFlex Hand]; we cast the fingers, the knuckles, the palm and the back shell, and then some internal parts that go inside the mechanics. An exploded view of RightHand Labs’ ReFlex Hand. Sarah: Working with CLEAR design lab helps us to improve our manufacturing process because they have such an expertise in design for manufacturing, molding, and production of plastics. We can design the part functionally and then they can help us figure out the best way to manufacture it. We have a really close relationship, so we share ideas back and forth. If they find something during production that they want to change, we can implement that idea by printing a new mold on the Form 2 or printing a new component that they’re overmolding. Kat: We work in the same town but we’re not in the same office. Both of us having a Form 2 really enables us to work collaboratively and remotely much more easily. We can send files back and forth and then each print the file on our respective 3D printers, and see and have that communication via video chat and have a model in hand that we are both looking at, so we are understanding the same thing. RightHand Labs’ ReFlex Hand has adaptive, flexible fingers and tactile sensing. ReFlex Hand's fingers are prototyped in Flexible Resin in order to mimic the compliance of the final parts. 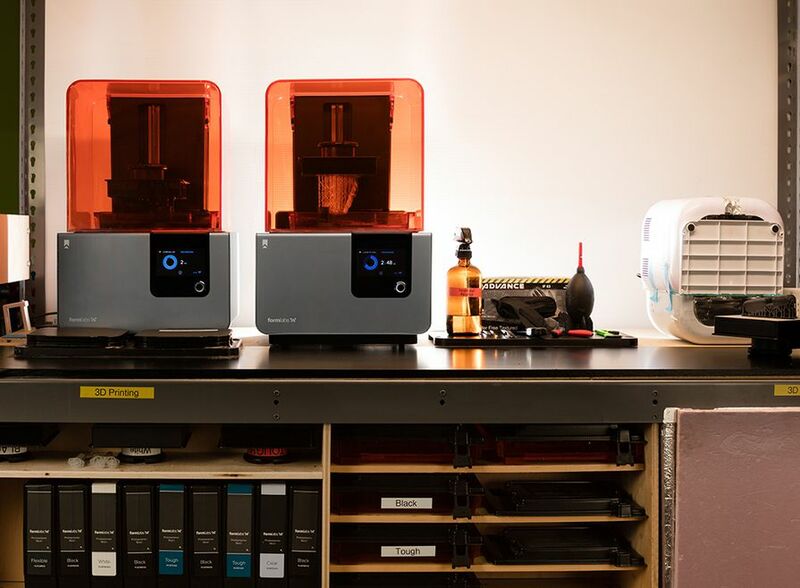 Learn more about Formlabs' full suite of Engineering Resins. What does agile manufacturing mean for your products and the way that you both operate? Sarah: We like to do a lot of small batch and short run production processes because it gives us the flexibility to change the design without sinking a lot of cost into the tooling. Just like software uses an agile approach to design, we are doing the same thing with our manufacturing approach. So after the product ships, we aren’t bound to keep it that way. Kat: So they are able to produce 20 units that they can actually sell, but in creating those 20 units, you learn things. You take those findings and make design iterations for the next batch of 20 units. We can do that because we’re 3D printing the molds and 3D printing the cores, so we’re not having this really high investment in tooling. Sarah: Our team is pretty small, which means that the engineers that are working on our products get to see every part of the process and they have a lot of say in every part of the process. So if they want to change something in the design, they have the flexibility to do so. If they want to change a part of the manufacturing process, they have the flexibility to do so as well. That absolutely leads to a better product because we can make changes very quickly so we can keep our product on the cutting-edge of the research and also the quality of our product is always improving. The RightHand Labs team is small, which means that engineers get to see and have a lot of say in every part of the design and manufacturing process. How does the ability to be agile affect the way RightHand Labs and CLEAR design lab work together? Kat: We’re in communication constantly. Both of us will talk about everything that’s working and everything that’s not working. We’re able to really iterate on the product rapidly while they’re selling units. For example, when we first started working together, RightHand Robotics didn’t have any sensors in the fingers. Once they started adding sensors there were some issues for the first couple of castings–on a certain percentage of them, the wire in the finger would shift to the side. We really wanted to have it in the center, so for the next round of castings we did, we changed the design for some of the internal components so it would hold the wire in the center where it belonged. It’s just been a lot of things like that, of producing 20 units, seeing what works, seeing what doesn’t, where the problems are, and having the ability to iterate it. A ReFlex Hand prototype next to the final product, which includes 3D printed cores and was produced with 3D printed molds. How does 3D printing fit into the short run production process? Sarah: Anything that we find in manufacturing or testing, we like to get into our final version of the product right away. The Form 2 really complements that approach because we need a tool that can move as fast as our design process is moving. Being able to 3D print in-house means that that we don’t have to wait on any external timeline to do our prototyping. We can go from CAD to a functional test within the same day. Kat: Previously, we were outsourcing a lot of 3D printing just because other 3D printers are so insanely expensive. Having cheaper access to prototyping really changes the whole design process so that you don’t have to get a design as locked down before you prototype it. You can design something in SOLIDWORKS all the day long and then you print it in a scale that doesn’t feel right or the ergonomics aren’t quite you were expecting. It really reduces the cost of product development, it makes it so that a lot of startups can exist that probably couldn’t exist before because they just couldn’t afford the cost of product development. Both RightHand Labs and CLEAR design lab use Form 2 3D printers in their production processes. What components do you 3D print? Sarah: We use the Form 2 to do prototyping of components that are going into our ReFlex Hand and our industrial systems. We also use it to make test rigs that we’re using when we need to test different components, and we use it on the manufacturing side to make molds for our fingers on the ReFlex Hand. Kat: The way that we make the fingers for RightHand Robotics is with a 3D printed core and some electronics and we stick that into a mold, and pour rubber around it. Then we take it out, stick it into a secondary mold and overmold around that. There’s this internal channel that goes through the core of the finger that’s for a wire that’s used to actuate the finger. You can only get that internal core through 3D printing. There’s really no other way to manufacture that. CLEAR design lab uses overmolding to make ReFlex Hand fingers. I do really like the SLA prints because they have a really nice surface finish. For production, you want parts that look finished. For prototyping, you still want to look like production quality parts. That’s sort of the whole idea behind the prototype, is that it should look like a final version. The prints come off the printer looking really nice, and then usually we sand them; they have a really nice quality to them that looks like an injection molded plastic. How does this process ultimately affect the end user? What’s the impact on industry? Sarah: We’re adding new ideas and features to our ReflexHand every day that our customers are asking for. Doing small batch production processes is part of our strategy for the ReFlex products because it’s the kind of niche market and the customers that we have are looking for very specific things, and they’re doing very specific research. We want to stay on the forefront of the kind of research that they’re doing. And so, as their needs change, we can change our product to match them. I don’t think we’ll ever be done designing for ReflexHand. As long as we have customers in the research community that have ideas that they would like implemented, we are willing to work with them to make sure that they have a solution in hardware. Kat: I think what we’re more interested in as a company is working on new technology products. You know, I'm not really interested in designing the 2016 style of X, Y and Z product. I'm much more interested in figuring out how technology is going to influence people’s lives in the future. 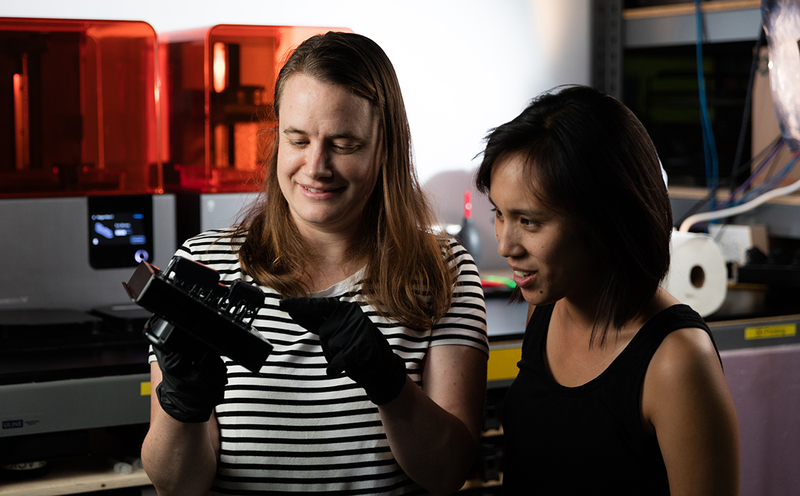 Sarah: If researchers don’t have to spend the time working on hardware and designing new hardware, they can spend their time solving new research problems and new robotics challenges. The more affordable and cost-effective we can make our grippers, the more research will be able to be done in new areas that are even more exciting.